Tags: software for healthcare, 3d graphics, design of human body, database of organs and tissues diseases, skeleton visualization, visualization of lymphatic system, visualization of blood-vascular system, visualization of inner parts of a human body, OpenGL С++, GLSL, TAO Framework C#. The software, developed with COM-technology, was interfaced with the software which controlled the medical equipment, to display both the current state of a patient and operational status of the equipment. The project included the development of special animation mode to simulate the operation of measuring equipment, to dynamically display electromagnetic fields , to simulate the moving parts of the equipment, etc. 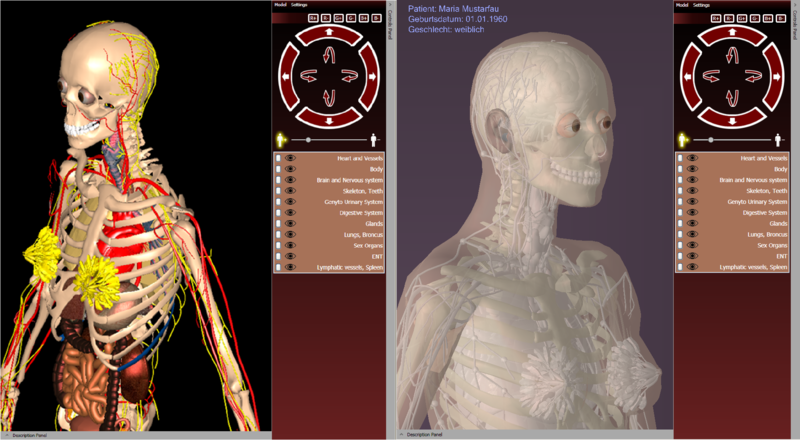 Highlighting, flashing, geometry and texture alterations were implemented to assist the diagnostic visualization of organs, with the help of shader graphics applications. Tags: QCAD, pattern designer, Delaunay triangulation, tailor, Hord3D, dress patterns, paper patterns, modeling of clothes creation, dress form visualization, virtual fitting-room, stitcher of clothes, creation of virtual skirt, creation of virtual trousers, creation of virtual sweater, creation of virtual t-shirt. 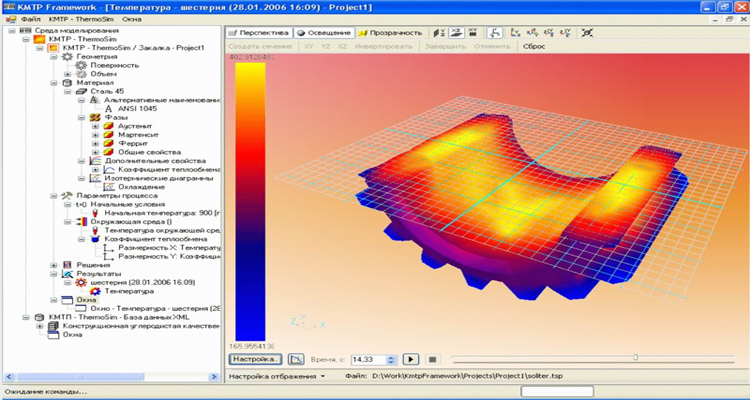 Technologies: C#, .Net, Marshaling, С++, QCAD, Delaney triangulation, Hord3D, DXF file format. Client: Quakeup Media Production, Inc. (Canada). 4) placing sewn patterns over human forms. 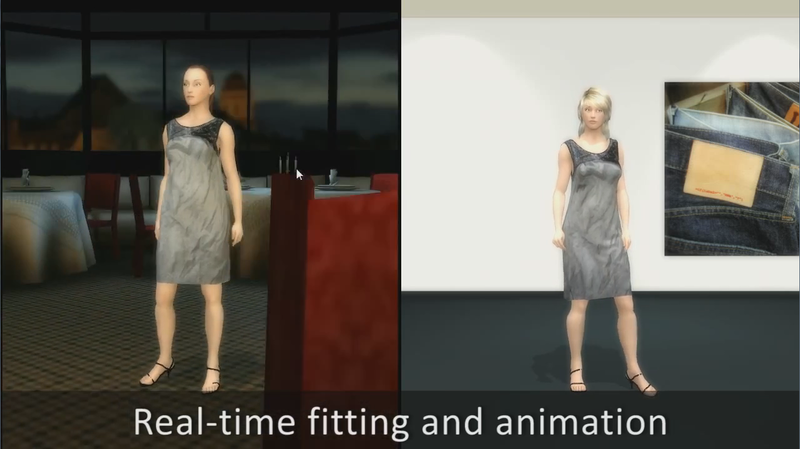 We therefore created a virtual tailoring tool which took into account varying human shapes and sizes. Tags: collision detection CUDA, processing of collisions on a video card, processing of CUDA collisions, collision detection algorithm , clothes fit test, virtual fitting room, real-time clothes fit-test. Technologies: С++, С, CUDA, QCAD. The main task was to optimize the algorithm for maximum possible acceleration. This task was successfully accomplished using CUDA technology and implementation of the algorithm for processing on the graphics card. The development of this module has thus provided the first opportunity to perform qualitative clothes fitting tests in real time. Tags: Ray-tracing, BVH, CUDA, Spectral Studio, creation of photorealistic images, image processing, effects for images, software for image processing, WPF c#, GPU, C++. Once all the optimizations for the “Aurora Renderer” module were implemented, a tenfold acceleration of image creation on video cards was achieved. Tags: visualization of online data, 3d visualization on the Internet, visualization of Internet traffic, visualization of distributed data, Processing Java. 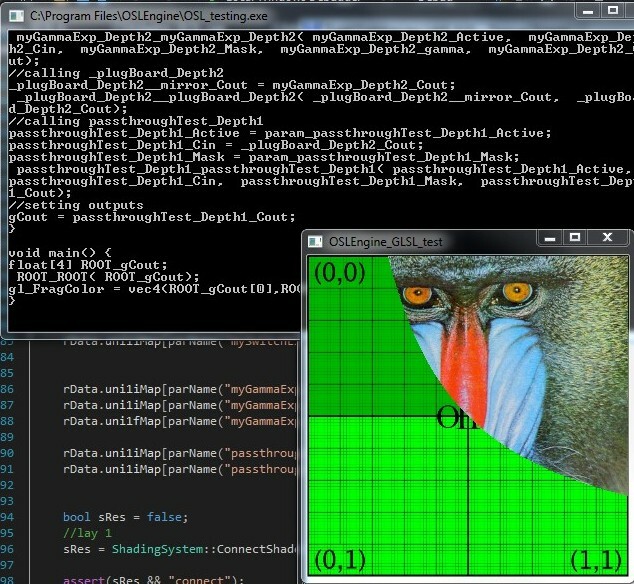 Technologies: Processing 1.2, Java SE, OpenGL (JOGL), GLSL. This project was aimed at the real time visualization of dynamically changing data on DYN servers. 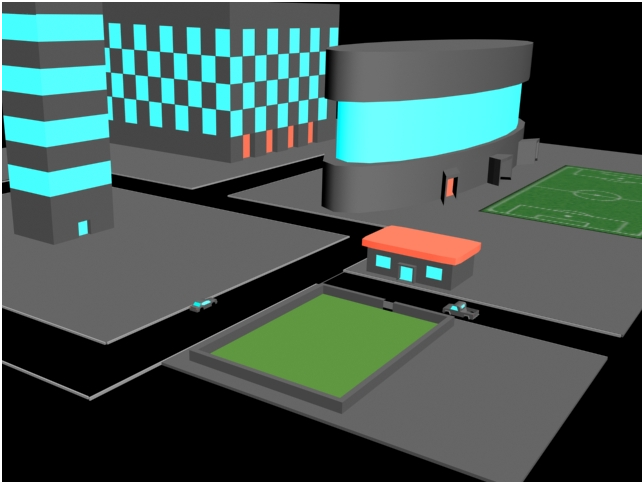 Processing data regarding network workloads, the number of user enquiries, location and direction of address of enquiries, the workload of specific servers and traffic information was represented in both 2D and 3D graphics. 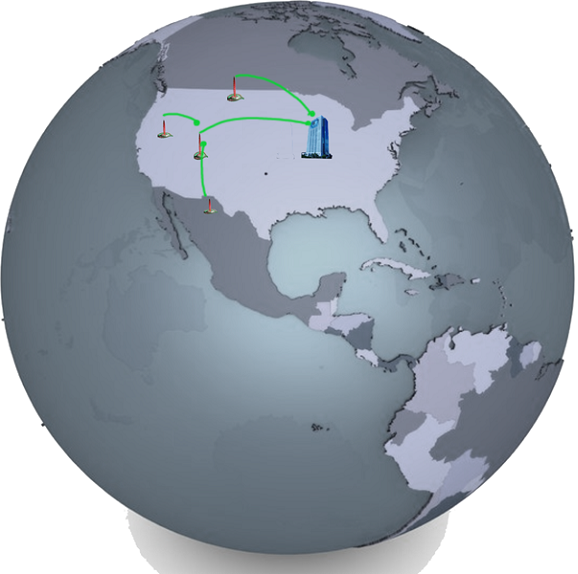 The 2D data was presented in dynamic graphs and tables, and the 3D representation included special effects such as dynamic radial lines representing global magnitudes (shown in the figure below), shading and blinking effects, company check boxes, texture variations, color gradients and moiré patterns from servers , etc., as well as scene control functions like rotation, scaling and hotkeys to adjust data visualization. Tags: visualization of distributed data, 3d visualization on the Internet, graph visualization, e-mail traffic, development of specifications, 3d web visualization. This project required software conceived to represent e-mail traffic from the sender to the final destination using DYN, according to special technical parameters as well as resource and time limits. The task was complicated because: 1) the initial data was diversified and stored on various servers on the Internet; 2) the amount of the initial data was very large and constantly updated; 3) users had to be able to consult this information clearly via the Web, including 3D. As a result, the data visualization concept was developed, technical requirements and technologies were described, and the approximate timescale necessary for project implementation was estimated. Examples of possible developments and available OpenSource solutions were represented. Tags: graphics effects, low-level adaptation of CPU code for GPU, backend creation, LLVM, LLVM-IR, OpenGL, С++, GLSL, CUDA, PTX, OpenShadingLanguage(OSL), OpenImageIO, Unix. Technologies: C++, OpenGL, GLSL, CUDA, PTX, LLVM, LLVM-IR. The aim of the project was to create a new backend for a specialized set of functions of the OpenShadingLanguage shader language (initially it only existed in CPU implementation, using LLVM to optimize and generate a binary code). The problem was significantly complicated by the necessity to develop executable code for the GPU, which was intended to accelerate the operation of the main application. 3) obtaining an intermediate LLVM-IR structure which is then adapted for GPU architecture, with subsequent manual output to GLSL shaders.Because of the specific nature of the main application, the third strategy was chosen. We obtained a GLSL code generator for the specific set of OSL functions, maintaining intermediate OSL optimization to apply on shader networks, for overall multiple performance improvement. Tags: Shaders, image processing, effects for images, software for image processing, GLSL, tree of effects, visual node network, WPF C#, image filters. C#, WPF 3.5, OpenDiagram, GLSL. 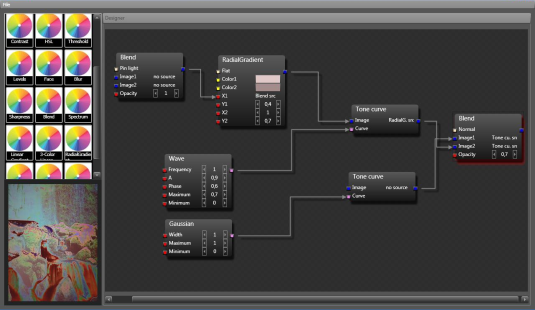 • the visualization of the application of a built tree of effects and the respective parameter settings. 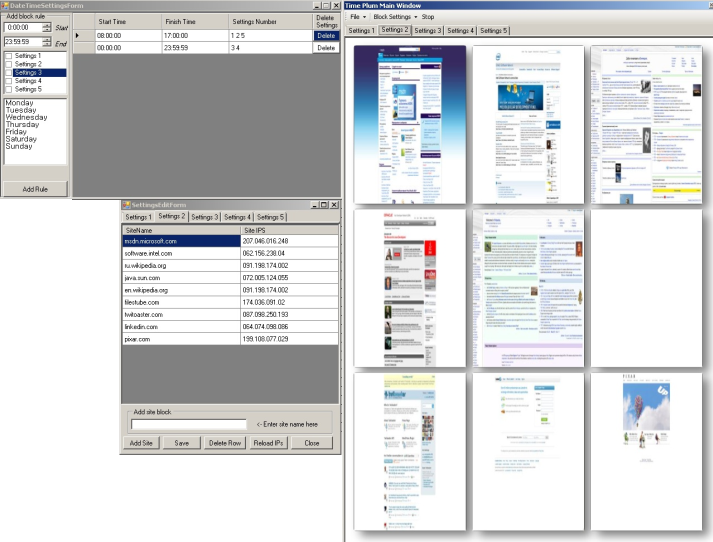 The user interface was implemented with WPF technology for the Windows XP OS. 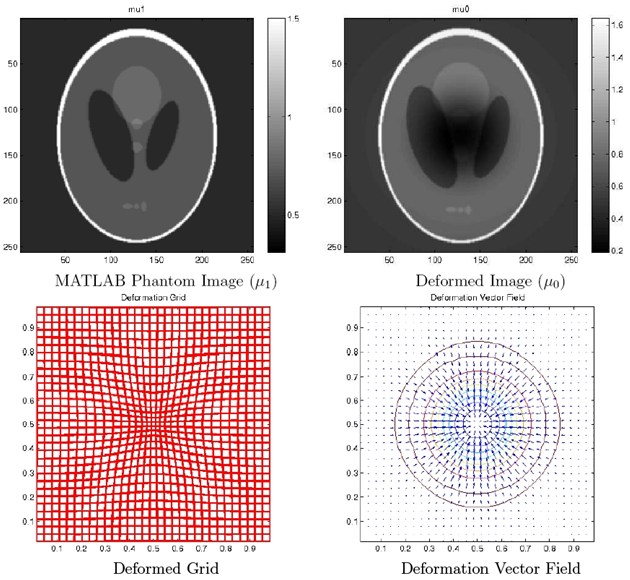 Tags: deformable registration, MATLAB, image deform, grid, mesh. Medical image matching – registration algorithms that deforms one image in a non-rigid [non-linear, elastic] manner to another. Assistance with the implementation of a particular algorithm from the theory in a specific academic – scientific paper. C++, C#, .NET Framework: WinForms, Windows Presentation Foundation; Managed DirectX, OpenCascade, FORTRAN, XML, MS SQL. 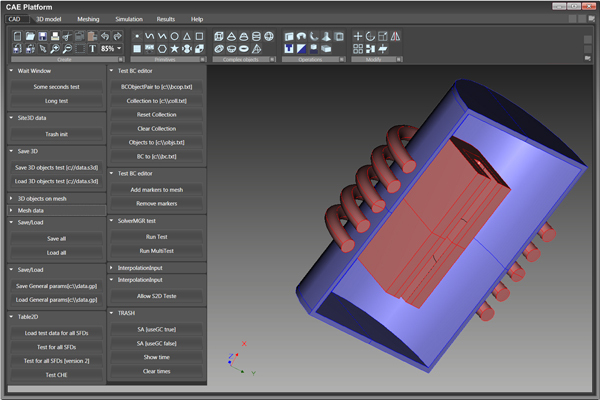 Software package supports 3D graphics for visualization physical fields in point of time. 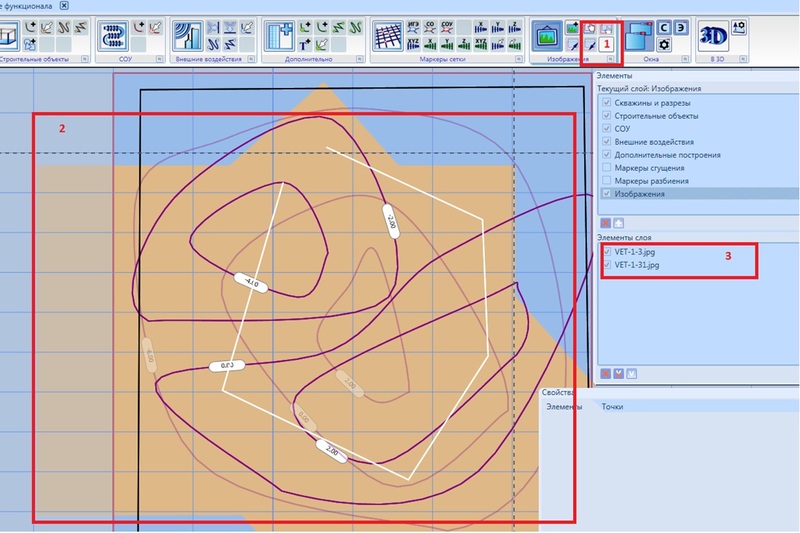 There are also many possibilities for creating of various diagrams that allow to carry out process analysis and optimization. C++, C#, FORTRAN, .NET Framework: WinForms, Windows Presentation Foundation, Managed DirectX, OpenGL, CUDA, XML, ADO .Net. EcoView software will provide tools for every phase of contaminants transport simulations, pollution impact assessment and pollution risk analyzing. In addition, EcoView will consider the modeling of heat, water transport in the soil etc., runoff processes, contaminants transport in groundwater and to surface water systems (rivers, lakes, bays). C++, C#, FORTRAN, .NET Framework: WinForms, Windows Presentation Foundation, Managed DirectX, OpenGL, CUDA. 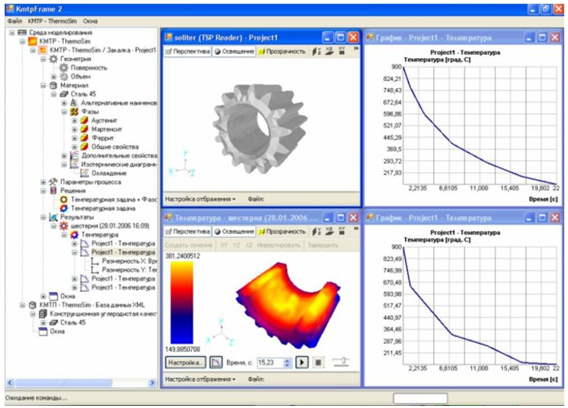 FSA-prognoz is a software for modeling and simulation of permafrost processes, custom developed for the company Fundamentstroyarkos. 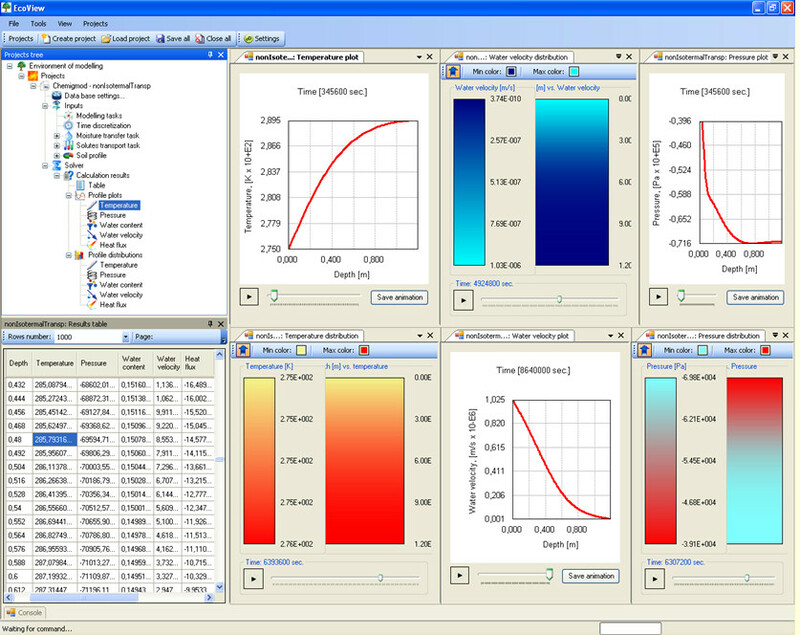 FSA-prognoz is our company’s first simulation software development for permafrost thermal stabilization. 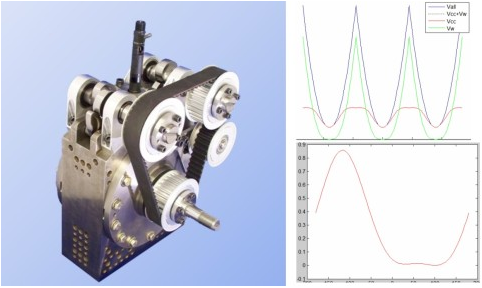 The FSA-prognoz numerical solver is based on ten years’ experience accumulated by our company in the numerical simulation of heat-and-mass transfer in the ground. Microsoft Visual C# (.NET Framework 3.5), С++ (Win API, STL, COM), Fortran 95. C++, C#, .NET Framework: WPF, WCF, MAF; Managed DirectX, OpenGL, CUDA. 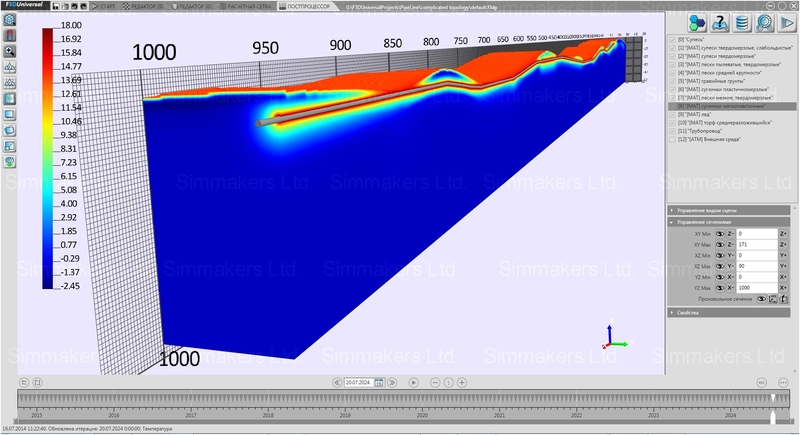 Frost 3D Universal software allows you to develop scientific models of permafrost soil thermal modes under the thermal influence of pipelines, production wells, hydraulic constructions etc., taking into account the thermal stabilization of the ground. The software package is based on ten years’ experience in the field of programming, computational geometry, numerical methods, 3D visualization and parallelization of computational algorithms. The utility model allows calculating the soil settlement with the additional pressure generated by weight of structures under conditions of ground thawing. Model is based on SNIP 2.02.04-88. 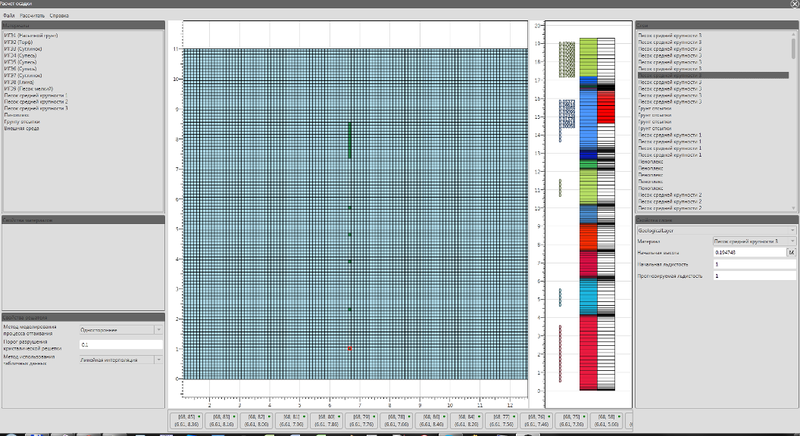 This utility can be integrated with the Frost 3D Universal software package for calculating ground settlement. Using the geological structure of the ground created in the software and the calculated temperature field, it can determine the settlement of soil base under structures (building foundation, pipelines supports, power lines, underground pipelines, etc.) as a result of ground thawing. Tags: face recognition, image processing, emotion detection. Tags: software, freeware, download, distribution. The program helps find, download, and install the best free software on the web. Free software is great. We’re going to make it even better. We’re working with Microsoft Visual Studio to build SoftwareSherpa, a program that will help you find, download, and install the best free software on the web. The first version is available for Windows 7, Vista, and XP. The user should be provided with the scene consisting of simple roads and buildings. User controls car movement – speed and direction. Several camera positions should exist: car driver’s view, behind car, above car and other user controlled positions. Scene should consists several bot-cars with analytical logic – collision control, traffic rules control, championship control. Tags: fluid physics, 3d visualization, parallel algorithms, graph visualization, flow modeling. 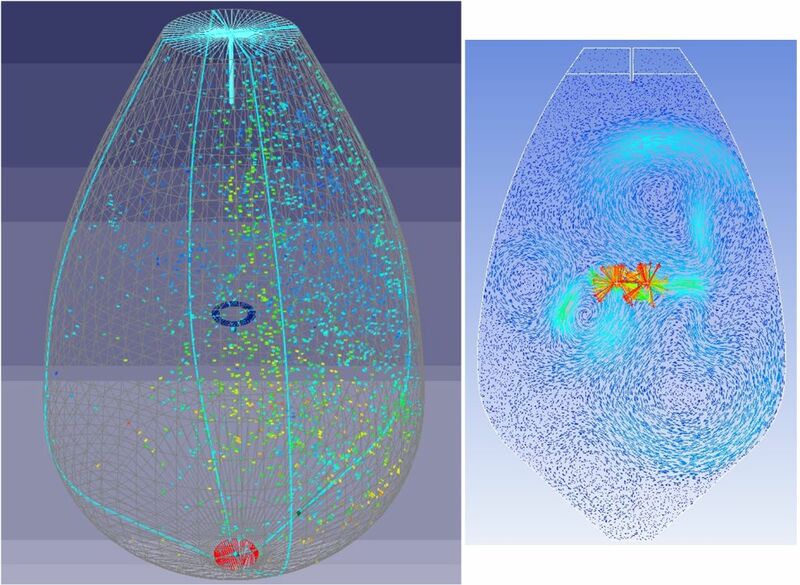 Technologies: Ansys ICEM CFD, Ansys Fluent, FlowVision. Mixing solids and fluid in 2 million gallons egg-shaped tank has a place. There are no solids concentration on the tank bottom – the solution entering the tank contains approximately 3 to 5% solids at 100 to 150 microns. The reason for mixing is to keep the solids in suspension. At the start of operation the tank is filled with water only and slowly over a period of a month is the bulk density of the full tank (usually 1.5 to 2.0 million gallons) reach a solids concentration of 2.5% to 4%. 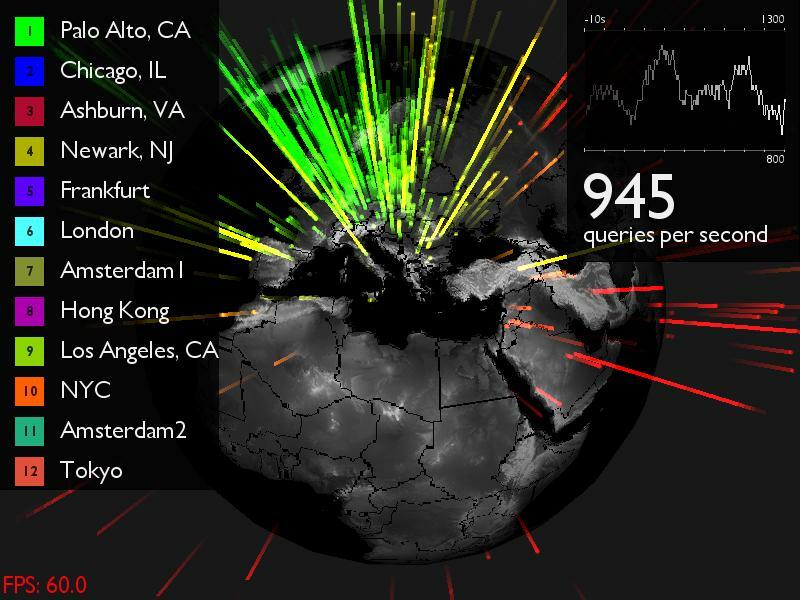 Tags: visualization of distributed data, visualization on the Internet, graph visualization, development of specifications, statistics visualization. 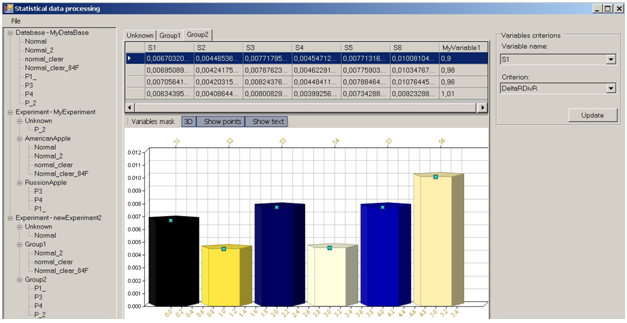 Discriminant analysis software, where as a discriminant function is used Mahalanobis distance. The usage of special inversion algorithms of covariance matrix allows for the software to classify such data which is not possible to be classified by MATLAB’s classify function (this data includes strongly mutually correlated variables). Tags: iOS, mobile, internet, geolocation, API. 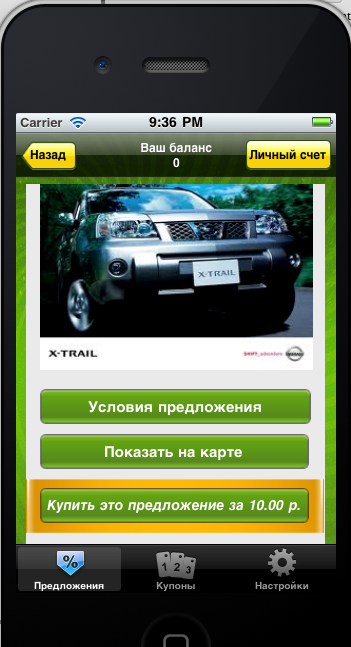 The platform is designed to create applications that allow you to search for discounts. It can be used by different discount services with similar API. Tags: internet, web, browsers, security. Technologies: C#, .Net Framework 3.5, Windows Presentation Foundation 3.5, IE Script. Support Windows OS; FF, IE, Chrome, Safari browsers. Software has 5 blocked sites groups with independent settings. Time schedule for blocking mode. Sites could be added in block list manually and using dragging feature. Password protection. Tags: engine, combustion, modelling, optimization.